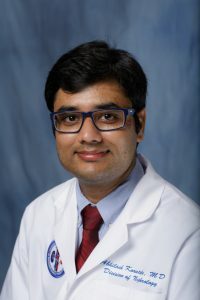 Dr. Koratala’s main academic interest is in studying kidney disease and hypertensive disorders in pregnancy and he directs the pregnancy and kidney disease clinic at UF Health. In women with moderate to severe kidney disease, the risk of pregnancy-related complications is much greater and the collaborative care and close monitoring by Obstetrician and Nephrologist is the key to improving outcomes. Dr. Koratala’s other area of interest is performance and interpretation of kidney ultrasound. Ultrasonography is a useful bedside tool that aids in the evaluation of acute kidney injury, kidney stones, urinary obstruction, kidney cysts and determination of volume status of a patient. It is also used to guide procedures such as kidney biopsy and dialysis catheter placement. Dr. Koratala is the director of nephrology imaging services and is actively involved in developing renal ultrasonography curriculum for nephrology fellows and medical residents. In addition, he is interested in studying the role of non-traditional ultrasound parameters such as renal resistive indices in acute and chronic kidney disease. UF Department of Medicine Exemplary Mentor Award. 2017. UF Department of Medicine Excellence in Teaching Award. 2017. Best Graduate Award for highest GPA in medical school. Kakatiya Medical College. 2008. Dr N.C. Iyengar Gold Medal in General Medicine, Kakatiya Medical College. 2007. Best Undergraduate Award in Forensic Medicine. Kakatiya Medical College. 2005. Best Undergraduate Award in Microbiology. Kakatiya Medical College. 2005. Dr G.N. Mathur Award in Physiology. Kakatiya Medical College. 2003. Dr G.H.R. Memorial Gold Medal in Anatomy. Kakatiya Medical College. 2003. Koratala A, Kazory A. Hyperkalemia in patients with chronic heart failure treated with RAAS inhibition. Poster Presentation, the National Kidney Foundation Spring Clinical Meetings, Orlando, 2017. Koratala A, Qadri SI, Kazory A. No difference in sodium removal with ultrafiltration therapy versus conventional diuretic therapy in patients with acute heart failure. Oral Presentation, International Academy of Cardiology 21st World Congress on Heart Disease, Boston, 2016. Koratala A, Alquadan KF, Ejaz AA. Performance of ambulatory blood pressure monitoring in predicting autonomic dysfunction. Poster Presentation, American Heart Association council on Hypertension scientific sessions, Orlando, 2016. Koratala A, Alquadan KF, Singhania G, Shimada M, Johnson RJ, Ejaz AA. Relationship of Serum Uric acid and Kinetic Estimated Glomerular Filtration Rate in Acute Myeloid Leukemia Patients. Poster Presentation, American Society of Nephrology Annual Meeting, Chicago, 2016. Koratala A, Singhania G, Alquadan KF, Ejaz AA. Real-Time Kt/V Tracking profile as a predictor of dialysis access recirculation. Poster Presentation, American Society of Nephrology Annual Meeting, San Diego, 2015.